O Canada. Steve Nash was turning into one of the league's best floor generals during his time in Dallas, but once he was a part of Mike D'Antoni's system all hell broke loose. Nash turned into the top point guard of the NBA. His high-octane style of play along with Shawn Marion and Amar'e, changed the league forever. 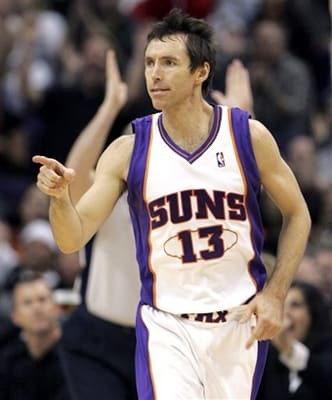 Those Nash-led Suns teams, took full advantage of the league's soft image. Big men? Who needs big men when you can score 120 PPG without one? He doesn't miss free-throws, he's clutch and he always puts the ball in the right place. Folks questioned Nash's MVPs after STAT's first year with the Knicks, but he's continuing to prove them wrong with his tremendous play.